Following Southern African Climates (Expedition 361), the ship entered a maintenance period that started on 31 March 2016 with a port call in Cape Town, South Africa. 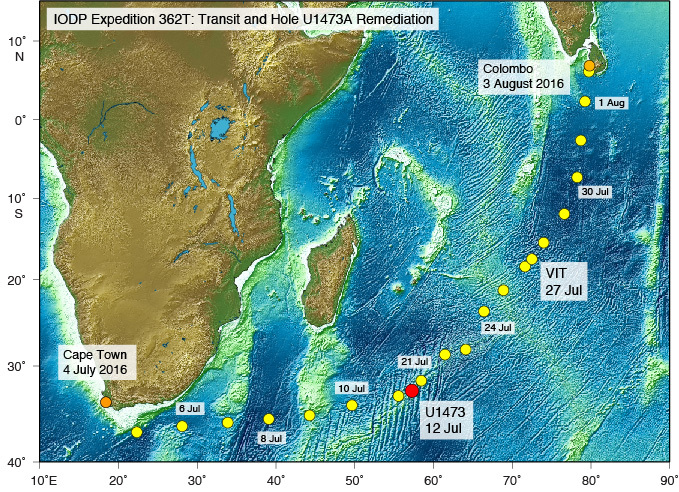 Following this, Transit and Hole U1473A Remedial Operations (Expedition 362T) will start from Cape Town on 4 July 2016, and end in Colombo, Sri Lanka, on 6 August 2016. Following a port call in Colombo, the ship will depart on 11 August 2016 for the start of Sumatra Seismogenic Zone (Expedition 362).